The Trail XP series features a 640x480 17µm thermal sensor and is available in either a XP38 or XP50 model. The Trail has excellent image definition due to its 50 Hz frame rate and innovative design, which draws heat away from the internal components allowing for an increase in picture quality and overall functionality. The Trail XP has a long detection range of 1350m to 1800m depending on the model, and utilises multiple zeroing profiles as well as a choice of up to 10 adjustable electronic reticles. 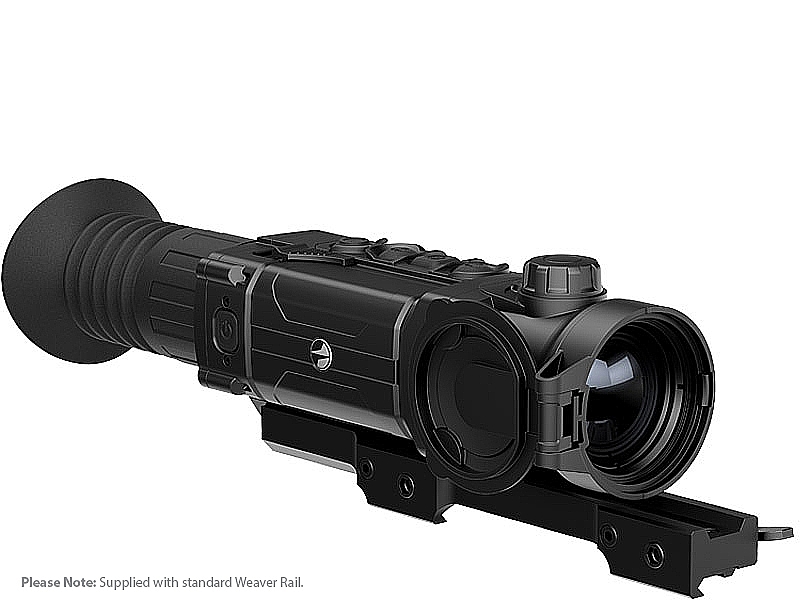 In addition to these features, hunters will be able to improve their target acquisition with the Trails built-in Stadiametric rangefinder, which gives precise distance on known targets. Trail models include up to 8x magnification and feature both 2x step-up and smooth, graduated magnification for a truly optimum, customised field of view. IPX7 waterproof-rated protection ensures the Trail performs perfectly in wet weather, even during intense rain, snowfall and submersion in 3 feet of water for up to 30 minutes. (IEC 60529). The Trail is designed with ease-of-operation in mind. User feedback has resulted in the most user friendly interface to date, complete with an easy-to-read, icon-driven, alpha-numeric status bar at the bottom of the display. Internal menu items and options are also displayed on a contrasting gradient substrate so you can keep an eye on settings without losing sight of your objective. Please Note: The Trail is provided with a Standard Weaver Mount. For information on the Standard Weaver Mount Click Here.